Our automatic responses in life often go overlooked in our busy day-to-day lives. Automatic thoughts and modes of being permeate everything we do and therefore may be the last thing we notice about ourselves. However, sometimes we take a class, read a select article, watch a video, or take a personality test, and we wake up to some underlying understanding about what has been running the show in our minds. My First Jolt: First Comes Dieting, Then Comes Budgeting? When I first discovered information about the psychology of systemizing, I was fully recovered from chronic anorexia. Even so, I still struggled once in a while with mental health issues (usually OCD battles regarding repetitive phrases, social phobias, or guilt around spending money). My rumination struggles and offbeat behaviors weren’t severe enough to interfere with my important relationships (or ability to earn a living), so, like many people, I limped along. Even as an adult, my discipline with money paralleled anorexia because it represented control, a scarcity complex, fun with numbers in my head when I was bored by my environment, and a self-created challenge to blow off the excess and false comfort of a modern society I strongly disagreed with. A few months after pondering the above connections, I discovered 20% of patients with anorexia are on the autism spectrum. Researchers have even theorized anorexia could be part of a “hidden autism” among adolescents. As a well-adjusted, well-educated, happy and healthy adult, I have no problem admitting my place in these statistics. I don’t talk about it openly with people in person, however, because I think they’ll hear the label “autism” near “anorexia” and not understand the complexity of each topic, let alone what happens when they are combined. I’m writing about this information now for the sake of personal reflection. I’m also writing to offer content I believe would have helped a younger version of myself. In addition, I think what I have learned personally and professionally about systemizing has helped me gain confidence as an individual struggling socially with my eccentric take on money. I've been on a wild ride. I have journaled obsessively every inch of the way. And now I am telling the story as an adult in love with being alive. I'll probably eat a candy bar in my warm cozy house after writing this. I was hospitalized three times by the age of 15. If I was hospitalized again, I was to be put in foster care. One time I went into the hospital on Thanksgiving and came out on Easter having almost doubled my weight. I missed well over a year of schooling by the time I graduated. I lived in a Ronald McDonald House for a few months feeling incredibly selfish around kids with cancer and incredibly confused about my dwelling's connection to McDonald's. I wonder what happened to all the interesting people I met. I hope they are OK.
How Do I Love Systems? Let Me Count the Ways! A system is a conglomeration of separate elements working together to produce results not obtainable by the parts alone. Language is a rule-based system, mathematics and music theory are rule-based systems, writing a song or a literary work and getting all the parts to move together, rewiring a house, analyzing the engine of a car, checking your finances with money coming in and money going out - examples are everywhere. 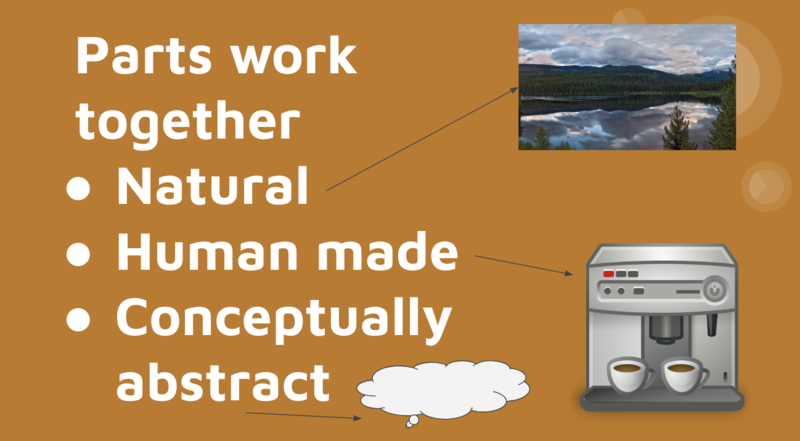 In terms of natural parts moving together - like solar systems or ecosystems or human-made inventions that are concrete and you can see them, like a school system or a coffee maker - these seemingly unrelated things are all brought together by their ability to be defined as systems. Human-made invented systems may be conceptually abstract theories ranging from theories on family dynamics (where the family is viewed as a system) to multiple theories that exist in the worlds of behavioral economics and software engineering. The added value a system gets is understood by the “pow” within the whole (compared to what may have been contributed independently by the parts). This extra “punch” and “pow” is created by the relationship in and amongst the parts, so how they are interconnected is paramount. This leads to variables and experimentation where you can test the different effects of different parts like a scientist (even in domains that may not resemble science, like the arts). I learned all the above information about systemizing while songwriting (and my ultra-productive get-a-day-job brain would sometimes tell me songwriting was a waste of time). If you learn a lot about one system, you are learning a lot about all systems. That’s one micro-macro realization that makes them amazing! What Does This Have to Do With Boring and Sucky Anorexia? It took me a long time to appreciate how a body is a very smart and powerful system. I toyed with this system on a dangerous level for a variety of reasons. One reason is that once you are sick, it is very hard to "think your way out" of a disease caused by your thinking. A very interesting starvation study conducted in MN at the end of WWII found perfectly normal and healthy men lost interest in social activities when put on restricted diets. They became obsessive, they talked less, they laughed less, they became apathetic, irritable, ecstatic and then depressed - all when they were starved. Self-injurious behavior also happened as a result of being starved. I bring this up to raise an important point. Some of the autistic traits seen in starvation are universal. Social engagement drops off the radar, sounds become louder, lights become brighter and smells become stronger - all to protect a vulnerable animal and help it focus on finding food. The repercussions of the starvation experiment followed many of the men in the MN study throughout their lives. For me personally, I wonder if the biological experience of starvation made saving money like a primal event (like an animal hoarding resources for the future and genuinely excited by any contrast of current "abundance"). Anyhow, even before anorexia, a high proportion of people who eventually develop anorexia have autistic-like traits. The complexity of identifying these traits is augmented by the starvation itself. Identifying the traits beforehand, however, could be of clinical importance and save lives. For example, those exhibiting high-systemizing preferences before the onset of the illness should be monitored right away if they express an interest in dieting. It is theorized that energy exchanges within the bodily system involving calories consumed and calories burned can become an engaging game for some of these girls (and boys). It’s a solitary game that lends itself to numbers, challenge, and most importantly - a distraction from social struggles, boredom, anxiety, or over-stimulation that may stem from the outer environment. If you are experiencing "financial anorexia" or real anorexia, it can be beneficial to bring creativity into your life in order to get outside of yourself. Of course, there are no strict solutions and what works for one person may not work for another. I can only tell my own story. As briefly noted earlier in this piece, I rapidly became better when I started playing guitar and writing songs. Even while it was happening, I didn’t think the "switch off" between them was a coincidence. I knew I was replacing one obsessive behavior with another (even if I didn’t have the academic language I have now regarding systemizing). Oftentimes we focus really hard on bad habits only to watch them get magnified, while replacement behaviors can be the key to real change. Not everyone will get better when they find a creative activity to engage their systemizing powers, but research shows it rarely makes a person worse. It’s interesting to note creativity is positively associated with empathizing. This is because self-reflection and understanding others aids in the creation of useful new ideas. However, the analytical abilities present in systemizing are what tear ideas apart, put them back together, and synthesize creations never seen before. In other words, song-writing required just enough of the robot in me to help me become more human. Part 2 goes deeper into the connection between perfectionism, giftedness, and money.